Brought back to Europe by Christopher Columbus from his adventures to the New World in 1492, this deep-red, spice gained popularity throughout Spain, and evolved in Hungary through the constant breeding of milder and sweeter strains during the 17th Century. The Spanish version of this brilliant red powder has a sweet flavor and full-bodied aroma. A favorite ingredient in Andalusian cooking. Add to fish dishes, sofritos, bean soups and sausages. A delicious complement to meat and poultry stews, egg dishes, steamed vegetables, and rice dishes. Used in Hungarian and Serbian soups, meat and chicken stews, barbecues, omelets, sauerkrauts and sausages. Combines wonderfully with veal and cream of Hungarian goulash dish. 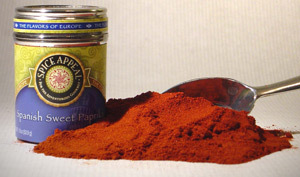 Paprika can also be used as a substitute for flour in thickening a sauce. Try adding paprika to a roux as a thickening agent, coloring agent, and flavoring agent.